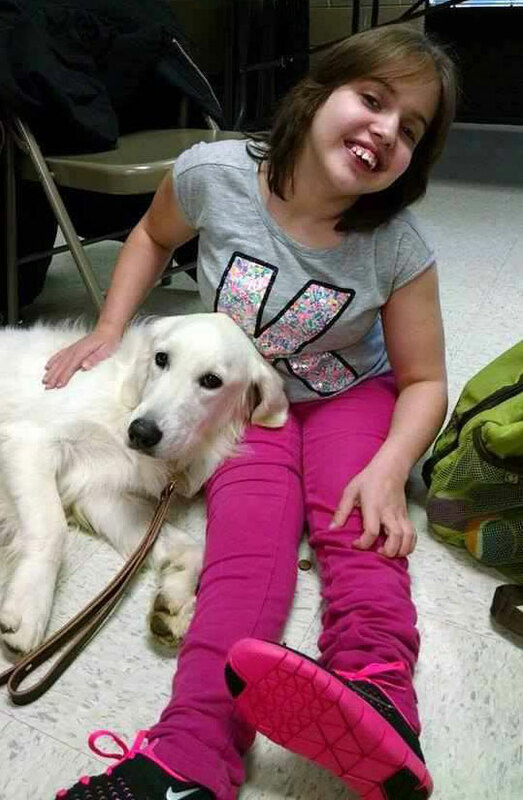 Kheira with her service dog Hazel, an English cream Golden Retriever. Hazel alerts to seizures before they happen. Note: This is an update to a story we previously shared on Kheira, who lost her service dog in 2013 on her 13th birthday. Kheira received her new 4 Paws for Ability service dog on Jan. 5. Hazel is an English cream Golden Retriever. She’s trained in mobility assistance and seizure work. She’s amazingly good at her job. Hazel alerts to oncoming seizures approximately 45-50 minutes before a partial seizure happens, and about 2 hours ahead of time for tonic clonic seizures, commonly known as grand mal seizures. She alerts by licking Kheira’s feet until I tell her “thank you.” We are working on getting her to bark when she smells one coming. I’m absolutely amazed at her ability to alert so quickly. 4 Paws for Ability has once again changed our lives. See the video below of Hazel alerting us. The seizure alert dogs are trained NOT to lick unless they are alerting. You can follow Kheira and Hazel on Facebook.